It is interesting to note that this dinosaur’s name means ‘different lizard’. The ‘different’ in ‘different lizard’ probably comes from its unusual vertebrae, which was much lighter than those of other dinosaurs during the time. 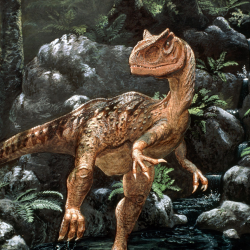 The Allosaurus lived in the late Jurassic period, dating back to nearly 150 million years ago! The dinosaur was named in 1877, by Othniel Marsh who pronounced the name ‘al-oh-saw-rus’. The fossils were discovered in Colorado, USA. Fossils of the Allosaurus were discovered in Colorado, Montana and New Mexico. They have been unearthed in North America, Europe, Africa and even Australia. The Allosaurus was a carnivore that ate stegosaurs and even iguanodonts that ate plants and headed the predator list. The Allosaurus was 12 m long and 10 ft in height, at the hips. It weighed between 4 and 4.5 tons! The Allosaurus was a feared predator and made quite a scary sight with its huge head and saw edge like socket set teeth. The lizard hipped dinosaur had short arms. It had hands with three fingers on each and this feature made it an advanced theropod of the age. The Allosaurus belonged to the phylum ‘chordata’, which implies that it had a hollow nerve chord that culminated in a brain. The Allosaurus a member of the Allosaurid family was first discovered during the closing years of the 19th century by Othniel Charles Marsh in 1877. It existed in the late Jurassic period about 150 million years ago and almost all of it’s fossils have been in the Morrison Formation in the North America, as well as in Portugal and Tanzania. The name Allosaurus means “different lizard” and is derived from the Greek root word “allos” meaning “different”. Like most dinosaurs the Allosaurus is believed to have had many variations of it’s kind. Scientists have thus far classified about seven dominant kinds of which some of the prominent types include Allosaurus Fragilis, Allosaurus Atrox, Allosaurus Maximus, Allosaurus Amplexus. In terms of physical structure, the allosaurus like most theropods was of a high stature. It’s believed to have grown to about 30ft tall, and being almost 40ft in length. Like the T-rex the most striking feature had to be the size of it’s skull which was enormous compared to the size of it’s much shorter neck. Again like the Tyrannosaurus the Allosaurus possessed a huge tail (acted as a counter balance) and tiny forelimbs consisting of three fingers. It’s estimated weight was around 2.3 metric tons. The skull of the Allosaurus was estimated to be around 33 inches in length giving it a decent sized jaw size. Each premaxilla (the bones forming the tip of the snout) held five teeth and each maxilla (the bones in the upper jaw) and dentary (the bones of the lower jaw) had around 14 to 17 teeth giving the Allosaurus plenty of teeth for the size of it’s skull. The teeth became shorter, narrower and more curved as you went towards the back of the skull and were probably constantly replaced during it’s lifetime. It’s no wonder that teeth comprised a significant proportion of the excavated remains of any Allosaurus. Some other interesting features about the Allosaurus include the presence of 2 horns which sat above and in front of the eyes and the fact that it had some of the best developed sinuses and smelling abilities of the theropods. Scientists have been united in the fact that the Allosaurus was a voracious predator and one of the most feared marauders amongst the dinosaurs. Their preferred victims were herbivorous (plant eating) dinosaurs like the Sauropods, Ornithopods and the Stegosaurids. Out of the above, it’s thought that the Sauropods were probably their most favoured food item, due to the extensive presence of Sauropod remains on the teeth of Allosaurus fossils. In the case of Sauropods studies have shown that the Allosaurus probably tore the flesh off from living Sauropods deferring the kill of its prey for some time. In terms of hunting behaviour it’s believed that the Allosaurus usually hunted in groups and their huge tail was also a vital component in aiding the trapping of other dinosaur variants as prey. This hunting in groups is attributed as a unique feature in the Allosaurus as it has been observed that most vertebrates do not usually hunt in groups. This carnivorous dinosaur was also extremely protective about its young, often hunting and gathering food for them till they were fully grown and capable of looking after themselves. The Allosaurus, like most Theropods were not very social and are believed to have been exceptionally reserved. This meant that even interactions with other dinosaurs of their own kind were met with distaste. Some scientists believe that the Allosaurus often wounded members of it’s own clan if any miscommunication or misunderstanding happened. The results of these interactions could often be fatal. Several scientists believe that the Allosaurus may even have scavenged off the remains of other dead or immobilized Allosaurus dinosaurs. One of the key differences between the adult and child Allosaur was the huge difference in hind limb length. The hind limbs of a child allosaurus were often considerably longer than the adults which allowed them to move swiftly and catch much smaller and faster types of prey. This would suggest that as the Allosaurus matured it would start hunting larger and stronger prey as it would be incapable of capturing the faster dinosaurs that it might have hunted when younger.